From The Team: Ideas for a healthy summer in the city! Summer is here and everything is looking so lush and green it makes us want to take heed of the plants and take the time to listen to and pay attention to our bodies as well. I’m sure you’ll all agree your body is your temple and we know that eating well and exercising leads to healthy minds and happy people. Here at Natasha Jade HQ we have been experimenting with different ways to exercise and eat healthier this summer and we wanted to share some ideas for a healthy and happy summer with you. The Grocery is the perfect place for the health-conscious consumer. This little independent grocery store on Kingsland High Street has everything you need with quality you can trust, at reasonable prices. Everything is carefully selected and caters for all dietary needs. Two members of our team are gluten free and we know we can rely on The Grocery for fantastic takeaway meals and even healthy guilt-free sweet treats. I am a huge fan of their tea collection and natural beauty products. Everything is beautifully laid out and the staff are friendly and knowledgeable. Not only is the shop brilliant but they also have a café with yummy food and a bar to unwind in at the end of the day. 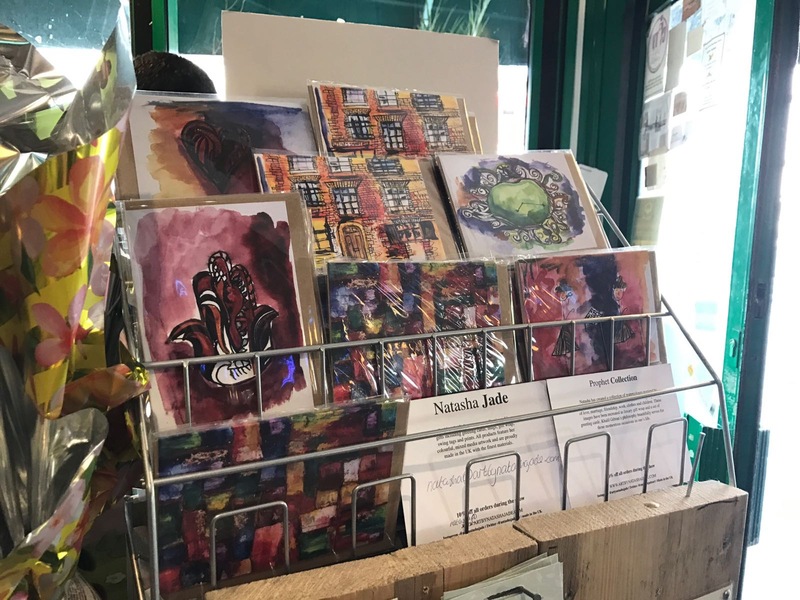 The Grocery is our most recent stockist and we are excited to announce that they now stock Natasha Jade greeting cards. 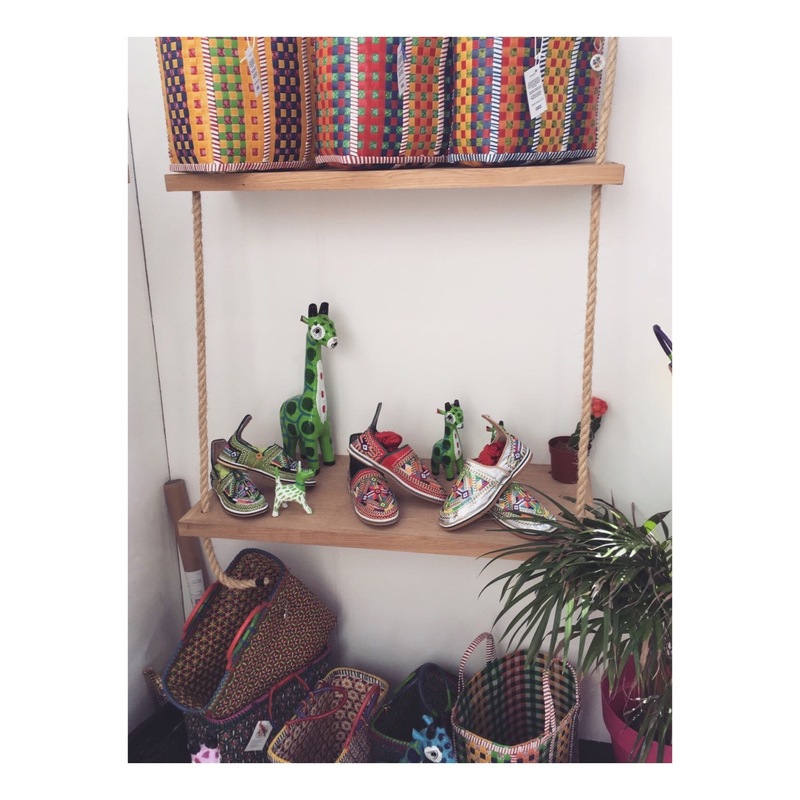 You can pick up a beautiful fairtrade gift and a Natasha Jade card while you do your healthy shop! 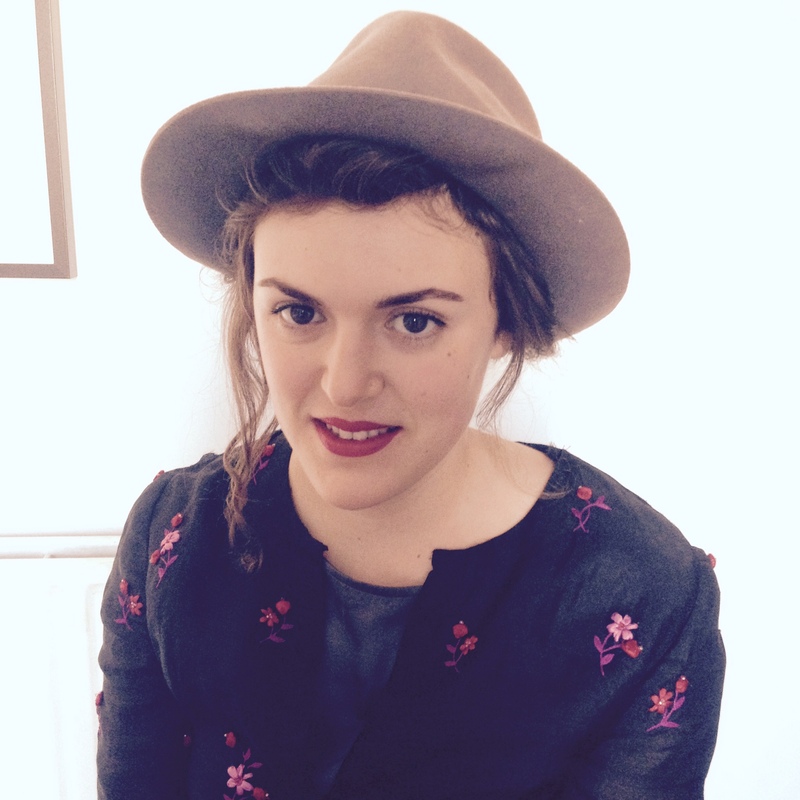 Talking of gifts, we recently celebrated Natasha’s birthday at The Place – a dance studio in Euston. I wanted to give Natasha the gift of dance as it’s a shared passion of ours, so treated her to a contemporary dance class. The studios are bright and open and they always have fantastic live music to dance to. The class we took was with Adrian Look who teaches in the style of Pina Bausch’s Tanztheater, aiming to express an emotional state through movement. The class is partly improvised and partly choreographed. It was the perfect movement class to help us connect with our bodies and express ourselves artistically. We can’t recommend it enough! We would love to hear from you. Do share your tips for staying healthy in London this summer with us. Spend your money well, invest in your health, and make it last. 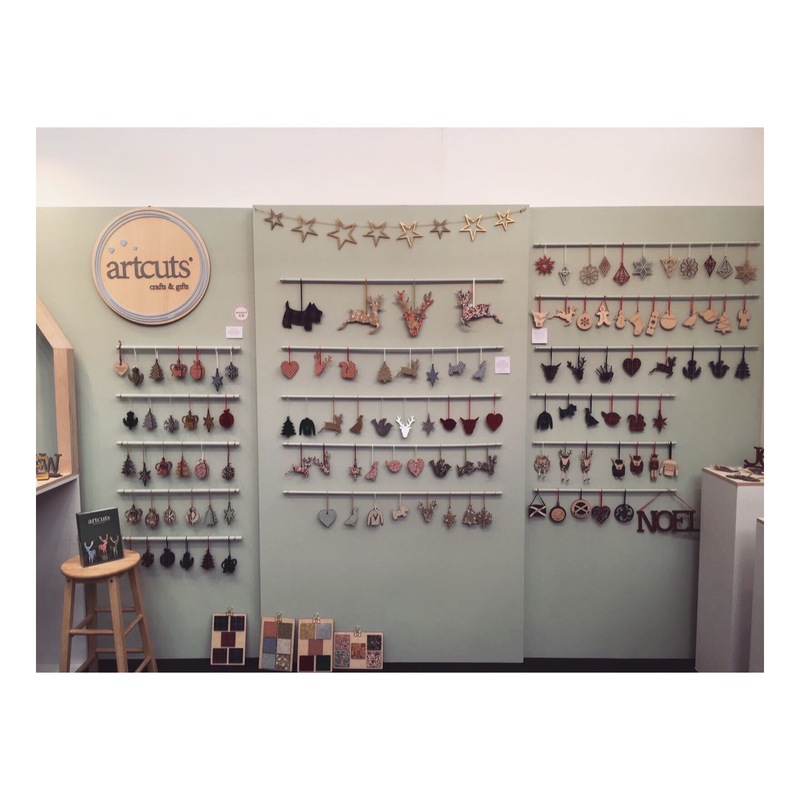 As ever we have had a busy start to the year, exhibiting at Top Drawer trade show showcasing new designs and meeting stockists from all over the world. We are proud to announce that some fantastic new independent retailers have joined our family and would like to take this opportunity to introduce them to our wonderfully supportive community. Not only do they now stock Natasha’s brightly coloured products they are also located in the most brilliant locations making the perfect outing and the best excuse to get out and about. So whether you’re in London or out on a day trip, do pop in and support these wonderful shops offering beautifully curated and unique gifts. Harry Brand is practically a neighbour to us, situated not far from our East London studio in the wonderful Columbia Road, a favourite hangout for all of us on the weekend. One of the few streets in the country composed of sixty independent shops! Go, East London, go! It’s the perfect place to visit small art galleries, grab a cake, buy some vintage clothes and take in the atmosphere. 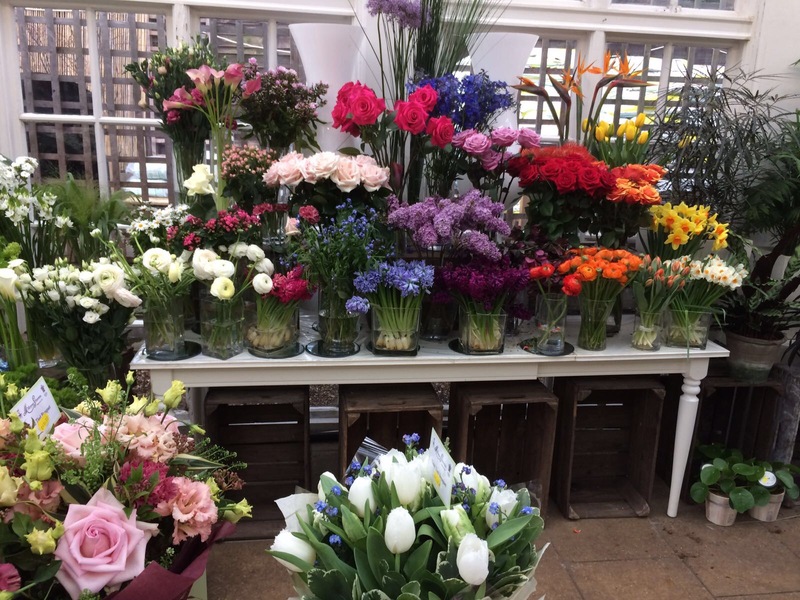 On a Sunday from 8am-3ish, you can catch the historic flower market, the best place in town to soak up real London. With barrow boys chanting “Everythin’ a fiver” ahh, music to our ears! Harry Brand is situated at 122 Columbia Road, London E2 7RG, in the middle of the south side of the street opposite the primary school. The nearest tube is Hoxton. 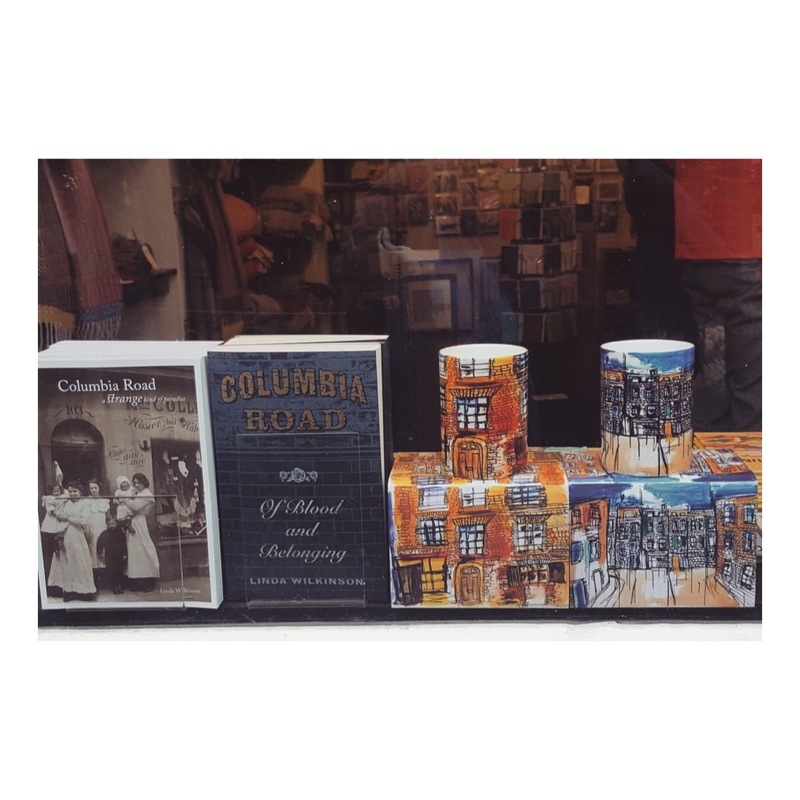 For more information about Columbia Road flower market click here. Open Saturday 12-5pm and Sunday 9-5pm (market day), specialising in beautiful cashmere, Merino, lambs’ wool, recycled wool and pure woollen blankets, throws, picnic rugs and scarfs from the British Isles. Pick yourself up some of their Harry Brand Harrisa Sauce whilst you’re there, it’s the best! Read more about Harry Brand here. Nantucket is situated in Reigate. Reigate is easy to get to from London with plenty to see in Surrey. Go for a walk in the Surrey Hills and stop for lunch in Reigate, a historic market town located in South East Surrey with a variety of fantastic restaurants. Home to a range of independent shops including antiques, craft, clothing boutiques, furniture and giftware. It’s steeped in history and dates back to the Battle of Hastings. Father and daughter team – Iain and Joanne – had the vision to bring unique gifts and homeware to the high street. 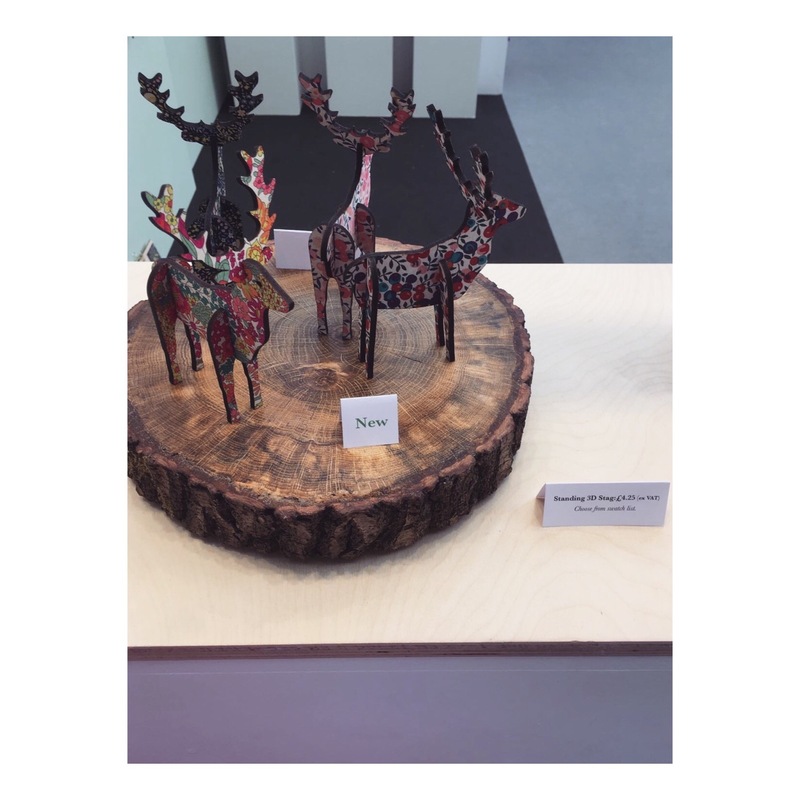 While creating a beautiful environment to shop in, they envisaged products that would be carefully sourced to give their customers something really special. Nantucket is an island thirty miles south of Cape Cod, Massachusetts, in the United States. With it’s New England style it seemed the perfect name. 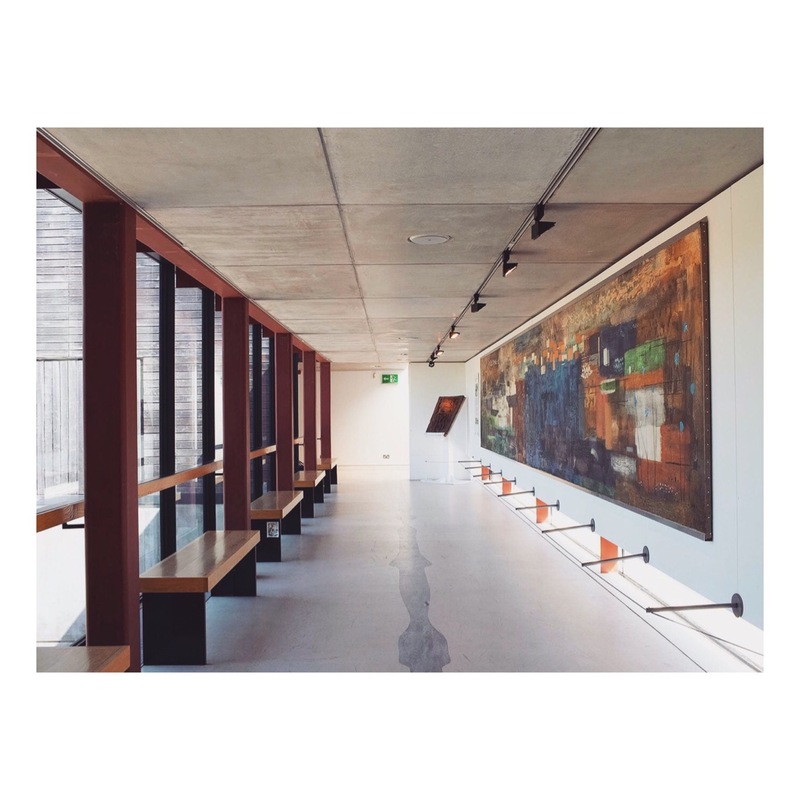 Winner of the Art Fund Prize, The Lightbox gallery and museum is a charity situated in Woking and is one of the most exciting cultural spaces in the South East. 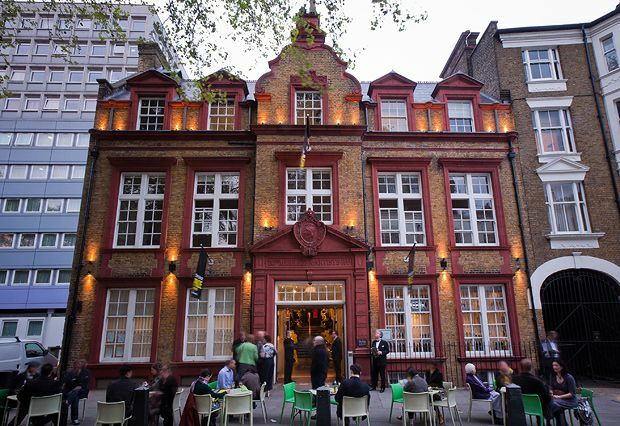 Three stunning galleries host a huge range of exhibitions, changing regularly. The building is also home to Woking’s Story, an interactive museum of the town’s history. If you are visiting with children you will find plenty to keep them occupied with hands-on activities and interactive displays. You can also enjoy lunch at the canal-side café. Afterwards, you can browse for a special gift or memento in the gift shop. Henley is truly one of my favorite places to visit especially in the spring. It’s very nostalgic for me as I spent a lot of my childhood at Henley College. It has so much to offer including lots of fun events like the Henley festival where I once danced to the bootleg Beatles and Henley Regatta. The best thing to do is to take a stroll along the stunning banks of River Thames in Henley and visit the award-winning building at the River and Rowing Museum. Explore the galleries and exhibitions, attend one of their events, take a look in the shop, or relax in The Cafe. The museum has four permanent galleries dedicated to Rowing, Rivers, the work of British Artist John Piper which has been a huge influence on Natasha’s work and the history of Henley on Thames. The Museum is also home to the magical Wind in the Willows exhibition which brings to life the much-loved story with 3D models, lighting, and music. Open daily from 10am – 5pm, the River & Rowing Museum welcomes visitors of all ages. As an artist, Natasha Jade is particularly porous to the world when she travels letting it shape and inspire her next creation. I encourage the same from you, shake off the winter and the extreme weather and get out there and explore and absorb the changing season. Treat your inner artist, learn new things, meet new people, shop from locals and enjoy your surroundings. 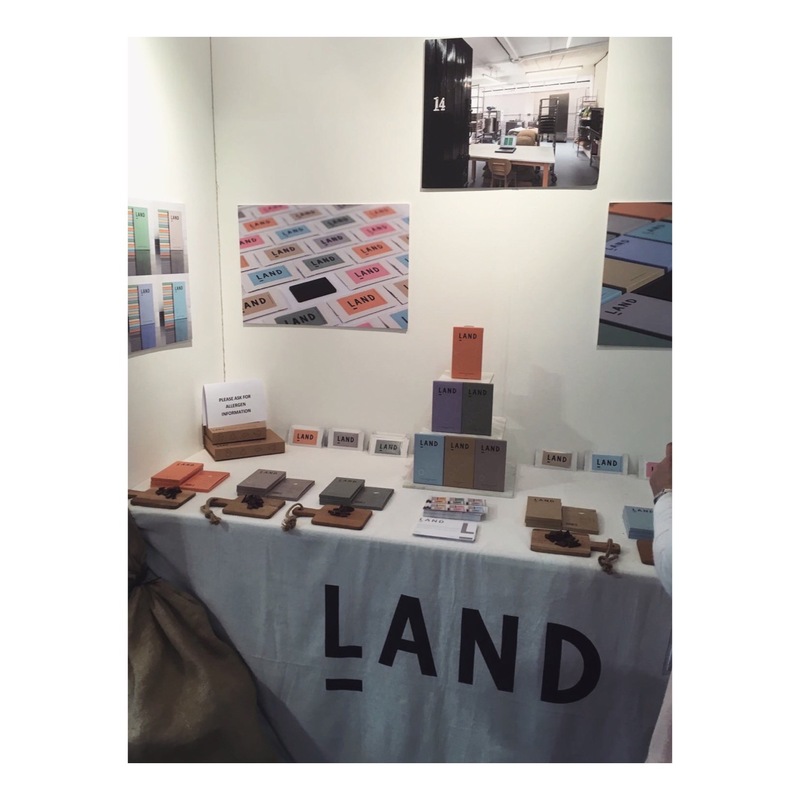 As ever, we had a great time at Top Drawer SS18, thanks to everyone who visited our stand! We love meeting new faces, catching up with our suppliers and making new connections. In striking, earthy colours, Quail’s Egg create beautiful ceramic kitchenware as well as stationery in plain and marbled paper which includes notebooks, wastepaper bin, file holders and wrapping paper. You can shop their gorgeous range here. 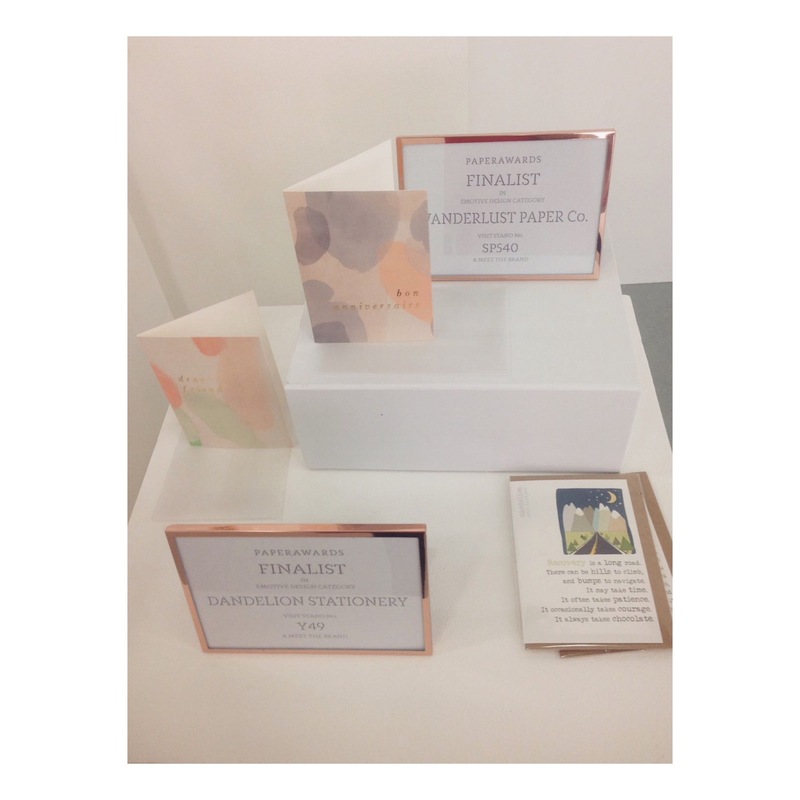 Noi stationery were noted for their use of colour in the SS18 Paper Awards and we can see why! 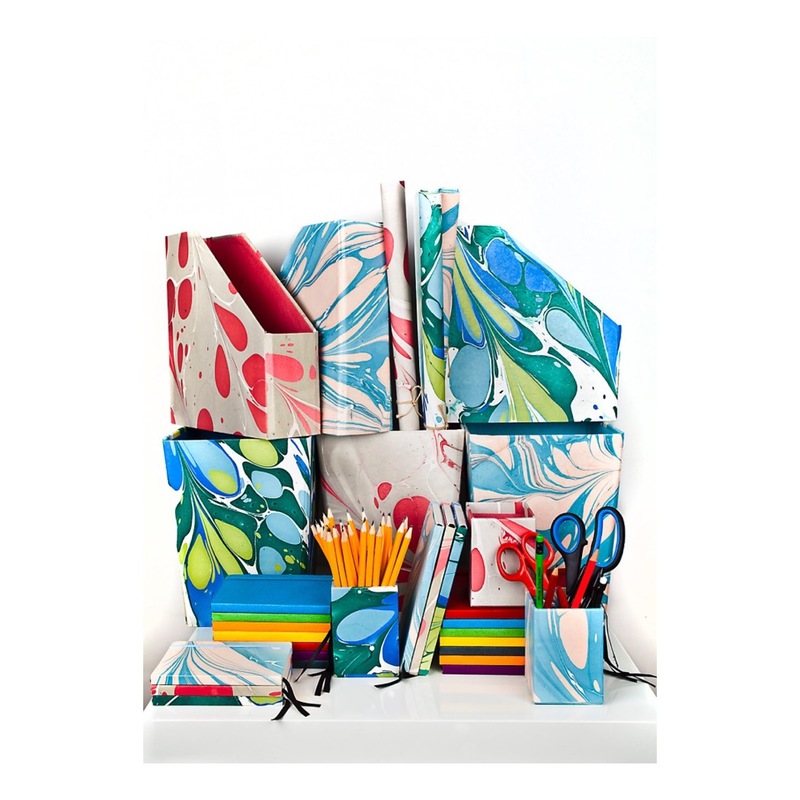 We love their vibrant, fun gift wrap and greeting card designs. Shop the range here. It was ARTHOUSE Meath’s philosophy that caught our attention this time. ARTHOUSE Meath is a collective of artists living with complex epilepsy and learning disabilities and we just loved the artwork and designs they created! You can shop their cards, artwork, accessories, confectionary and more here. With a name like Wanderlust and a dreamy, romantic approach to design, how could we pass this stand by? Visit their shop to see more of their beautiful greeting cards. We hope you enjoyed our Top Drawer diary! You can view our range of greeting cards, gift wrap, prints and mugs on our shop here. Our Country Living Fair 2017 Diary! 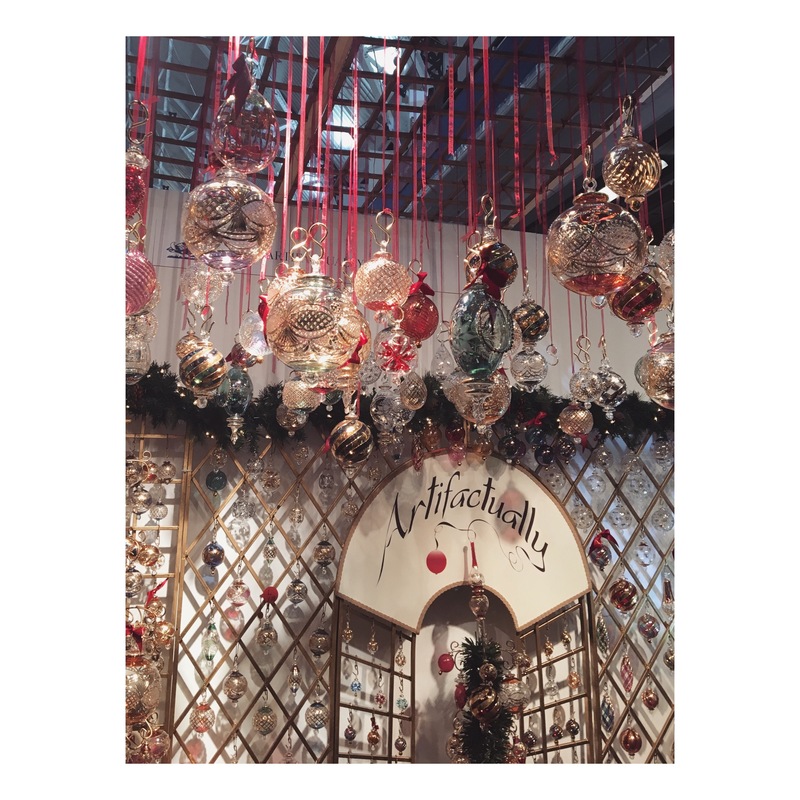 We had such a great time kicking off the Christmas season at Country Living Fair – meeting new faces and discovering new exciting brands! 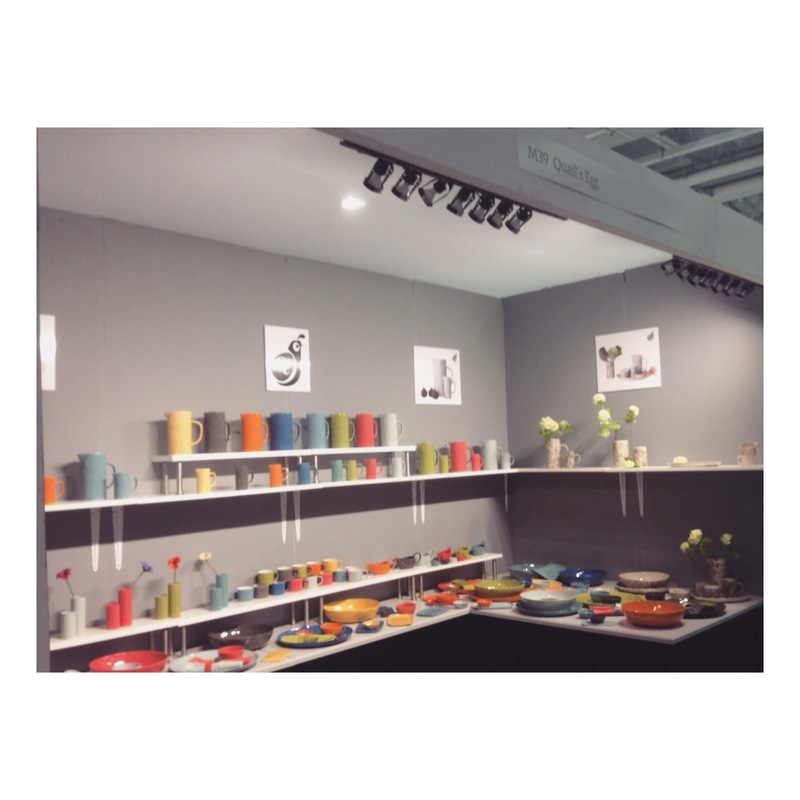 Here are some of our favourite stands and brands from the show…. Artifactually create these beautiful glass baubles made to treasure. We just couldn’t stop staring at them when we spotted them hanging at their stand. We want some for our tree! It’s hard to get a sense of just how fabulous Coco & Kinney‘s stand was from a still image! 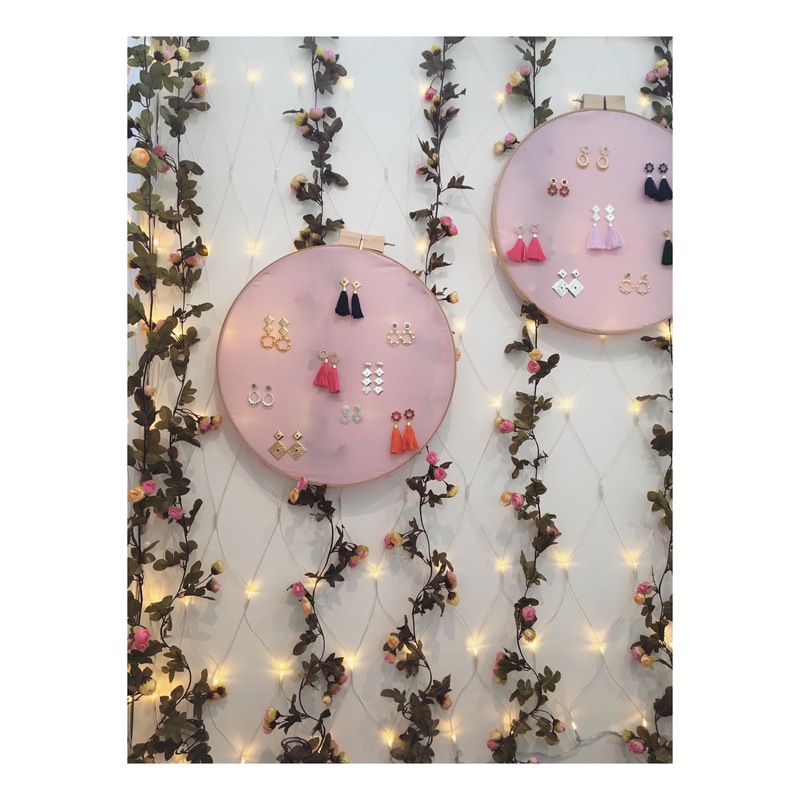 The fairy lights were flashing on all sides which drew our attention to their gorgeous jewellery instantly. We love their use of vibrant colours in their tassel earrings. 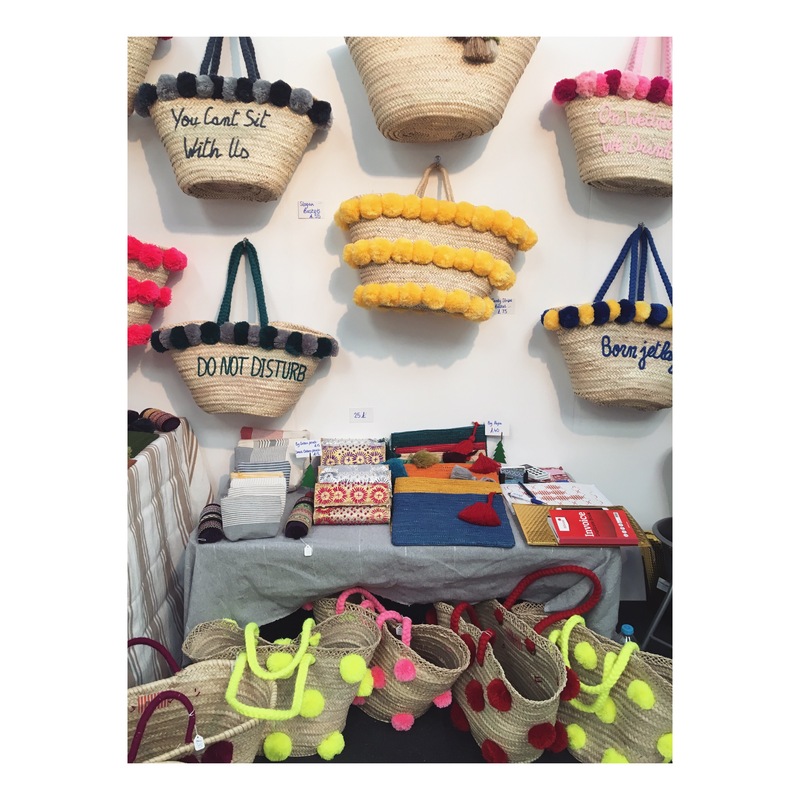 Another brand that caught our eye is Bom Bom Morocco who add vibrant pom moms to basket bags. They can even create a personalised one for you! 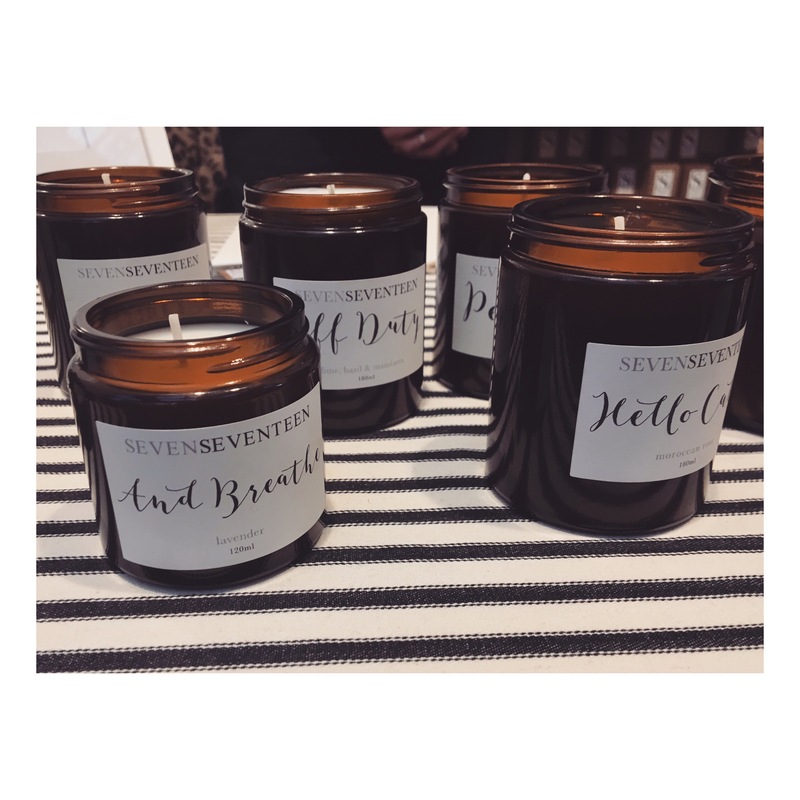 It was the beautiful scent drifting from Seven Seventeen‘s stand that caught our attention this time! Their plant-based candles are poured in England, have long burn times, smell gorgeous and are much cleaner than standard paraffin candles. Need we say more? Flowers – if you follow us on Instagram or have seen our Spring Flowers collection, then you’ll know how much we love them! 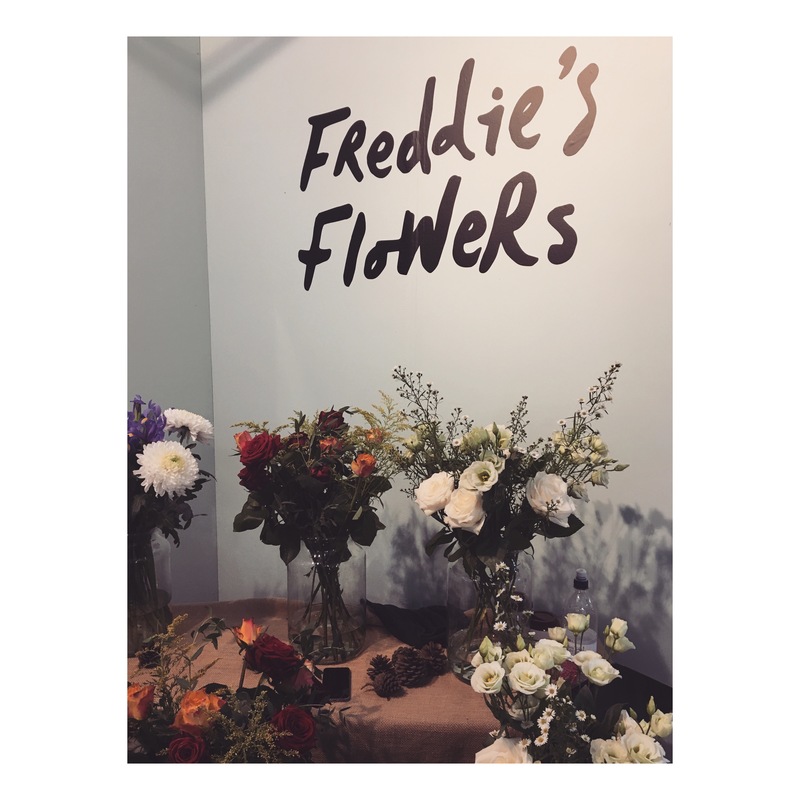 So when we spotted all these bunches of beautiful flowers at Freddie’s Flowers we had to stop by. And when we learned that they deliver flowers straight from the farm meaning their flowers last up to 2 weeks, we were pretty much sold! 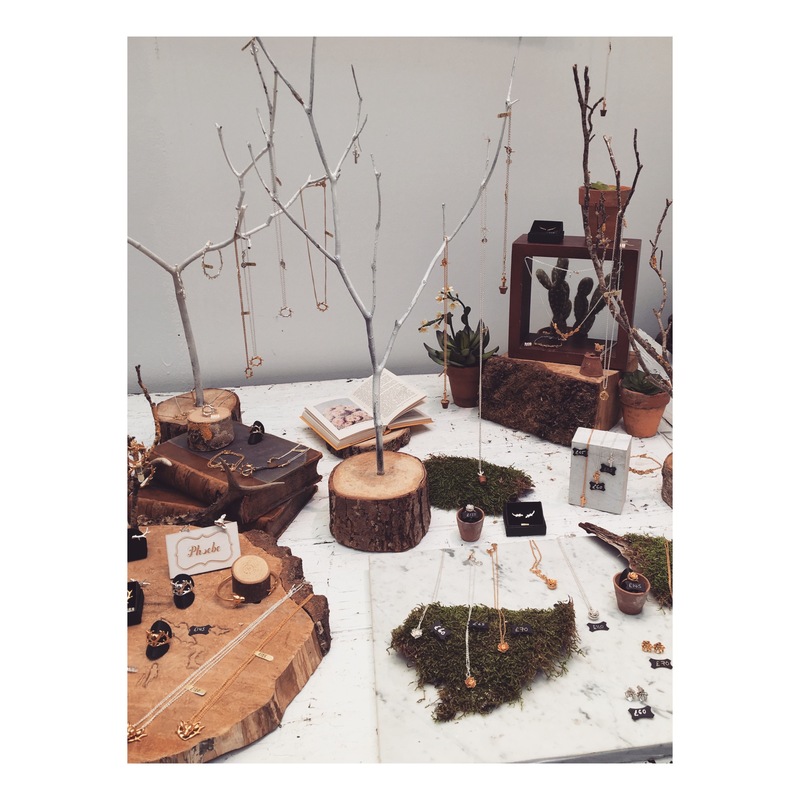 We loved the way jewellery brand Phoebe displayed their beautiful jewellery using tree-like stands and moss. Beautiful! Jewellery designer Phoebe Sherwood creates playful, nature inspired collections handmade in silver and gold vermeil, and we liked her jewellery so much we ended up buying some ourselves! How lovely is Little Leaf‘s stand!? We adored our neighbour’s display, complete with a magical window which was actually a painting created by a family member! 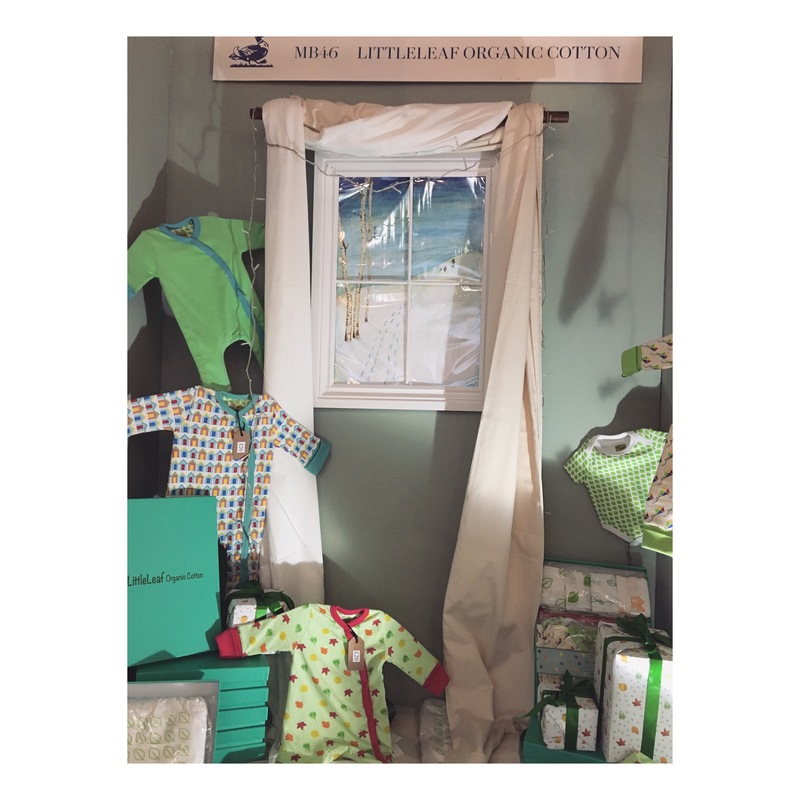 They create 100% organic cotton baby wear in eye-catching designs and organic cotton sheets and pillowcases in a luxurious 300 thread count. Perfect presents for any new babies in the family! 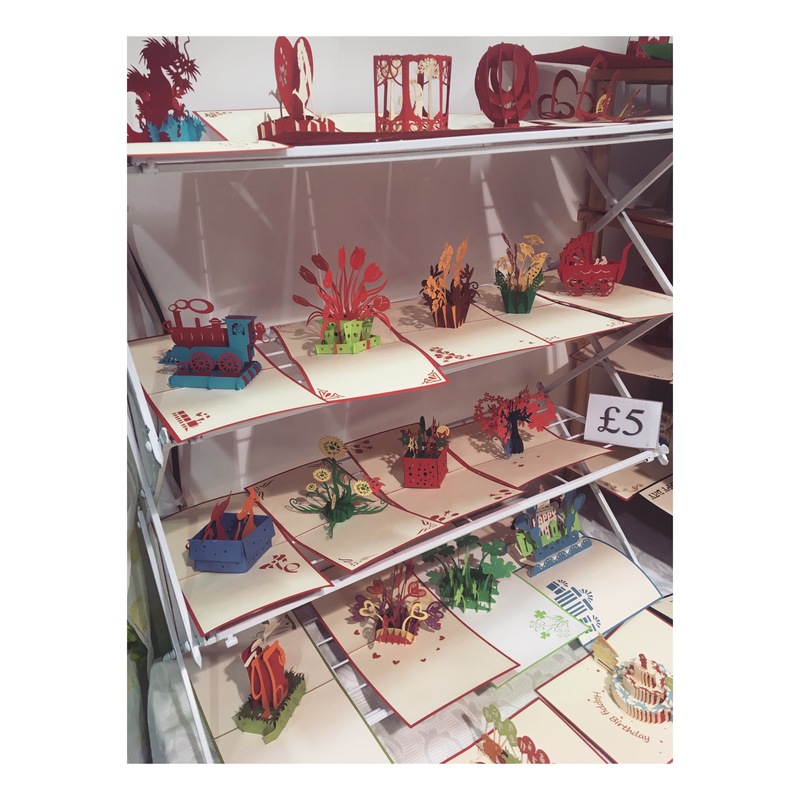 Pop up Cards create amazingly intricate origami and kirigami pop up cards. Perfect if you want to make a big impression this Christmas! We hope you enjoyed our Country Living 2017 diary, and we hope you all have a wonderful Christmas. See you next year! 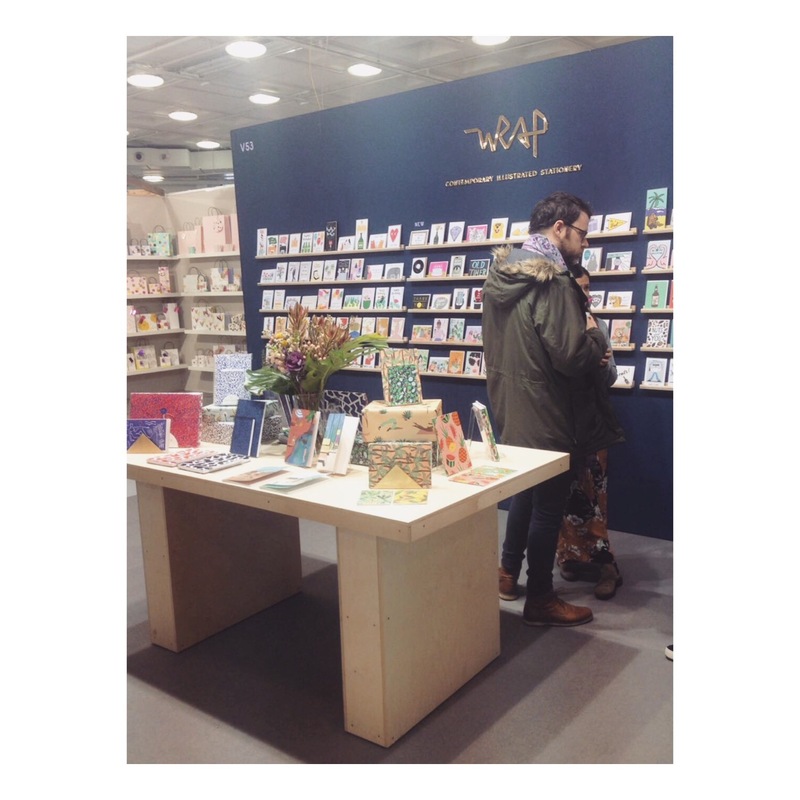 Last month, at Top Drawer AW17 we launched our Autumn Leaves collection of greeting cards and gift wrap and met some amazing new faces and brands from around the world. Tatty Devine create playful laser cut bold jewellery.. and we want it it all! 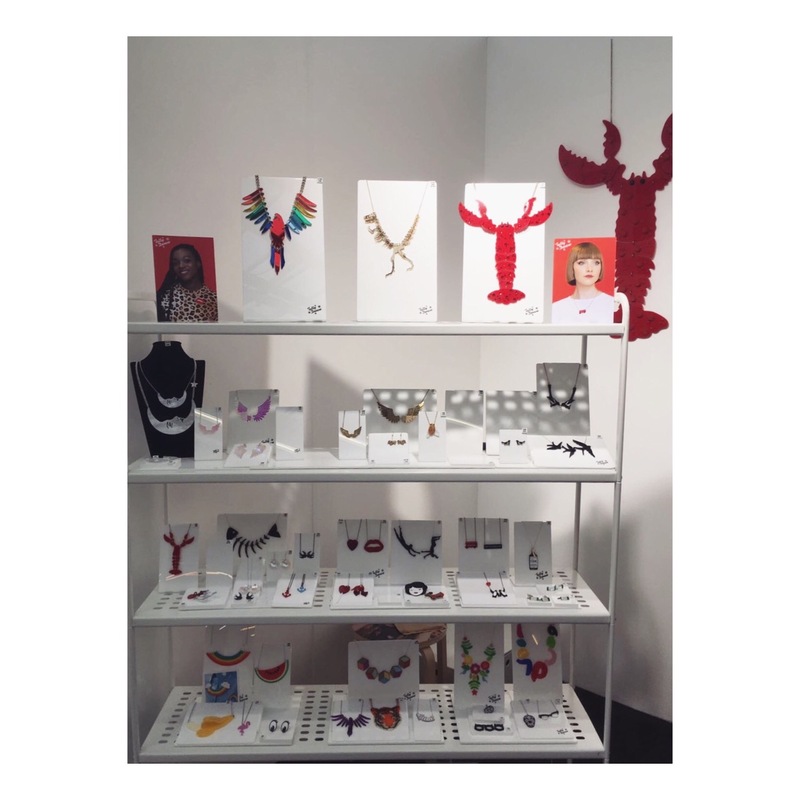 It was great to see their new collections including their amazing lobster necklace. Mowgs create beautiful and unique accessories inspired by beach, urban living, bohemia & festival culture from around the world. We loved meeting the team behind the designs! Artcuts design and make decorative gifts using hand silk screened papers wooden laser cut shapes, wooden cut shapes. They can make pretty much anything you like so get creative and get in touch to see what’s possible! Land use the world’s finest cacao in their chocolate with the whole process of chocolate making takes place in their workshop on the backstreets of E2. Trust us, it’s yummy!! It was great to meet so many exciting brands and we look forward to seeing you again at future trade shows! 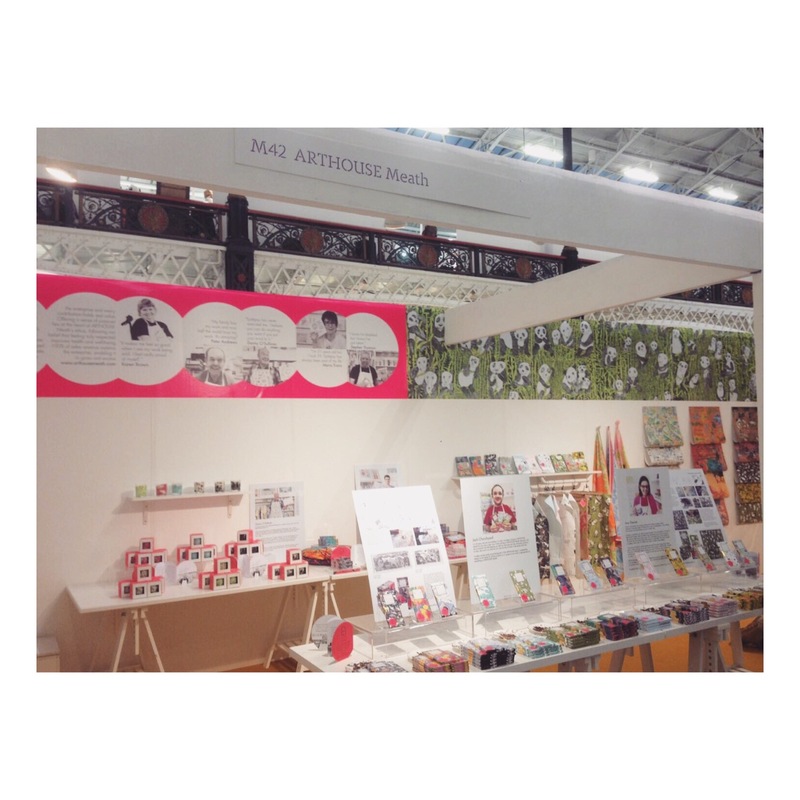 Thanks to everyone who checked out our stand, you can view our latest collection on our shop. See you next year! 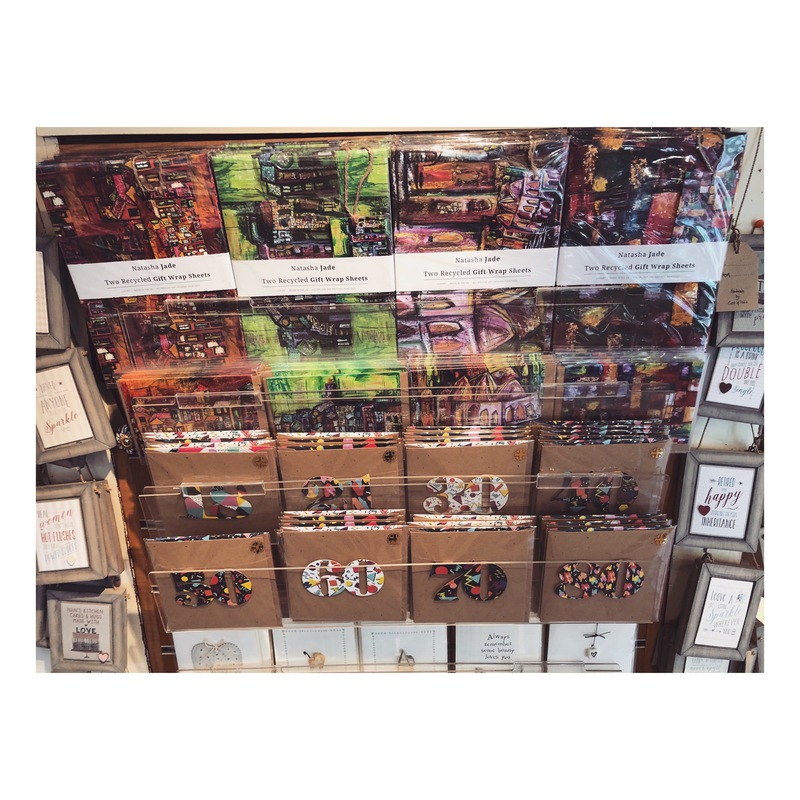 I have just visited Bermondsey for the first time in a decade to drop off some Natasha Jade greeting cards at our brand new stockist, and I am in awe at how much the area has to offer. I have rapidly reverted back to a goggle eyed tourist, delighted by the buzzing street and all it has to offer. If you, like me, haven’t visited this part of town for a while, then you simply must go! I walk past delicious bakeries, funky restaurants, artisan coffee houses and the enticing Fashion and Textile museum, calculating in my head when I can come back and spend some time here. I reach my destination. 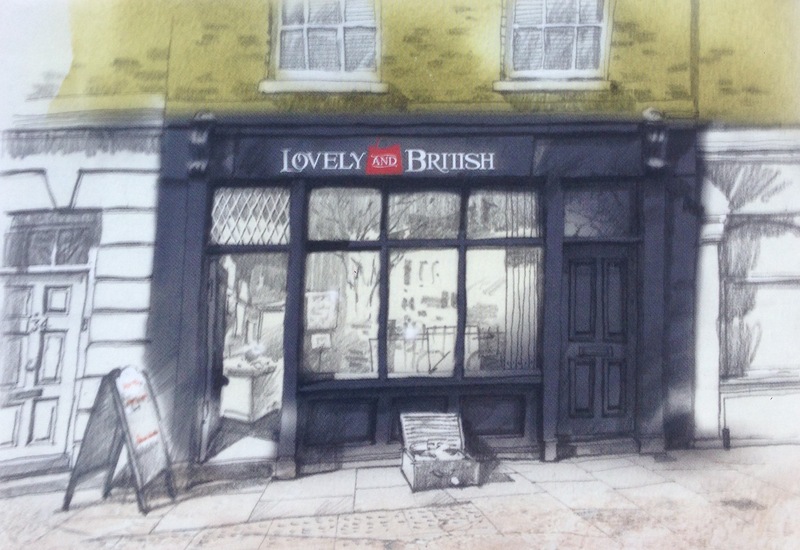 Lorna and John are our fabulous new stockists at The Lovely and British shop and the name represents exactly what you find inside. As you walk through the door your senses are awakened with candles upcycled in wine bottles perfectly placed as I’m greeted by a smiling Lorna, who sits on her throne surrounded by a Pandora’s box of everything to make the perfect gift! 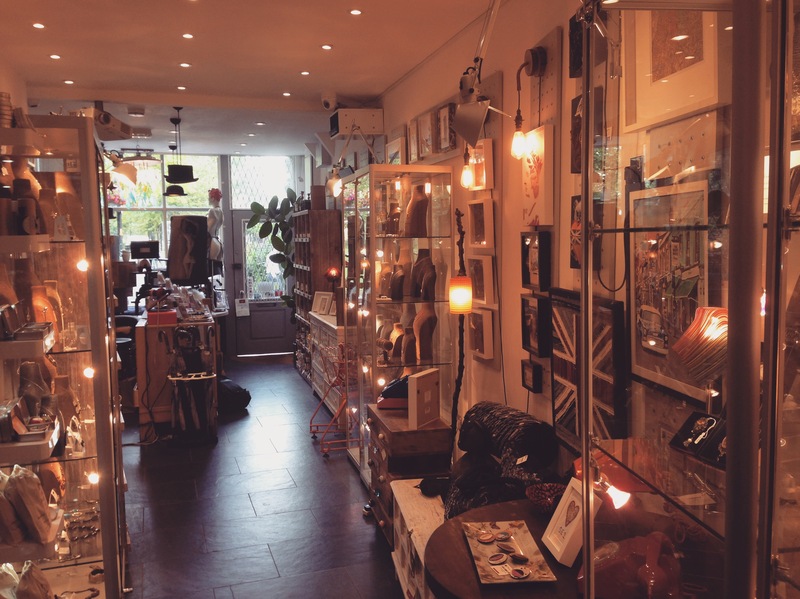 The shop is a catwalk of British delights including stunning butterfly artwork, key rings with coins from every era and beautiful bespoke mirrors to name just a few. The card selection is fantastic and we are excited to sit amongst the designs they already have in stock, adding a splash of colour. To add to my excitement Lorna tells me that this Saturday 16th September they have a free festival with music, food and a fancy dress dog show! I know what I’m doing this weekend! What about you? We have been really busy here at the Natasha Jade Studio with lots of interesting new projects following a knock out show at Top Drawer SS17. We have some exciting new stockists that we would like to introduce you to. Of course we are thrilled that they now stock Natasha Jade products, but they also house so many other great products making them great destinations to visit! 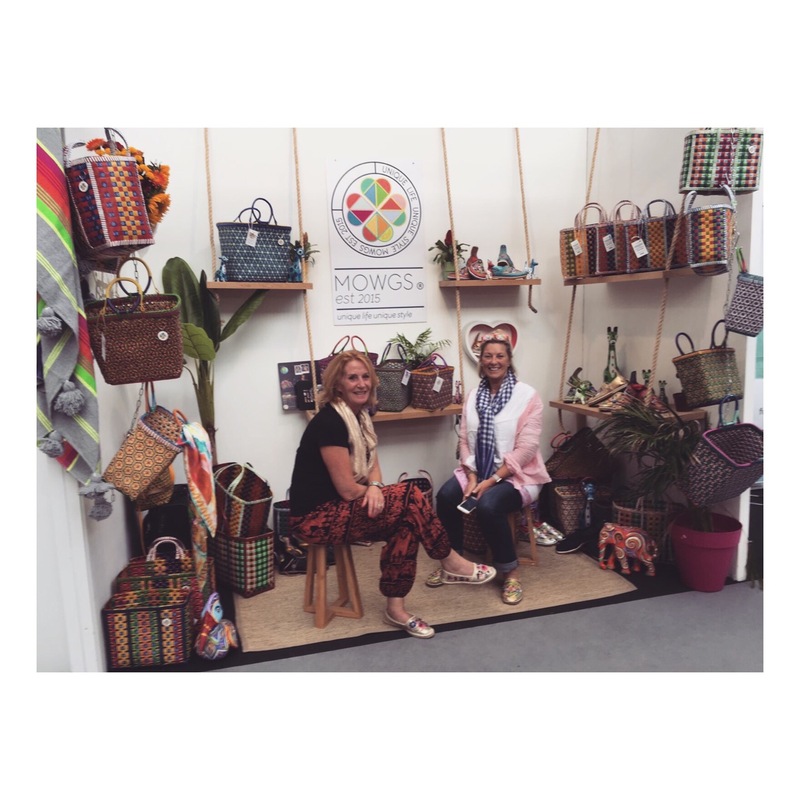 Natasha met Catherine who runs Mi Vida at Top Drawer 2017 and they got on very well! 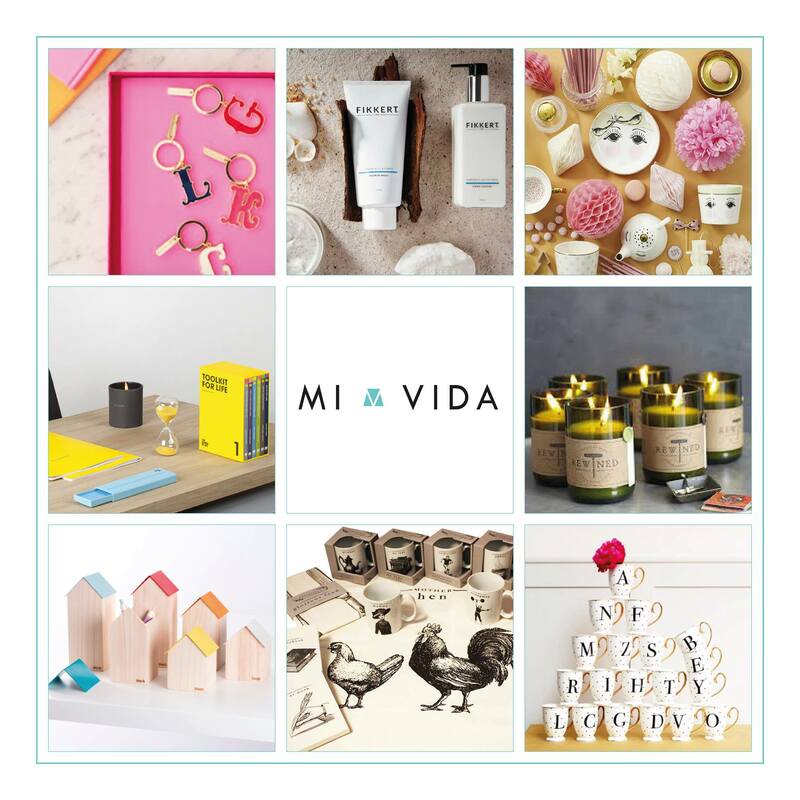 Mi Vida (who are based in Liverpool and also have an online shop), have always been passionate about the latest trends, homewares and fashion. Over the years they have become expert shoppers for special gifts they’ve discovered from their world travels. We are thrilled to have our cards, prints and mugs for sale within this great mix of products from around the world. If you want to escape the hustle and bustle of the city like we all do from time to time then why not head over to the Cotswolds where our brilliant social media savvy lady Jess grew up. You can pop by and see the friendly and knowledgeable Amanda Hanley – an interior designer with a classical style. 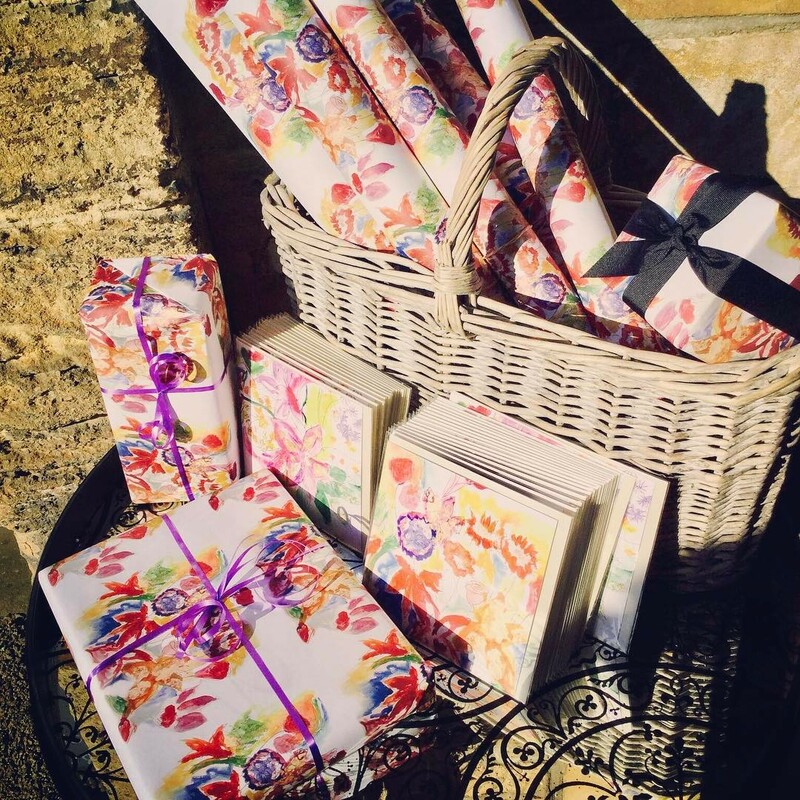 You can visit the welcoming studio space stocked with beautiful home furnishings fabrics, wallpaper, and pillowcases in Burford, Oxfordshire. Perfect for new décor ideas. If you don’t have time to run off to the country and bathe in a pool of flowers, then go for the next best thing and treat yourself to a gorgeous bouquet from Moyses Stevens. They use British flowers in their world famous flower arrangements wherever they can from the stunning countryside of Dartmoor. Their bouquets are bursting with colour and dreamy scents. 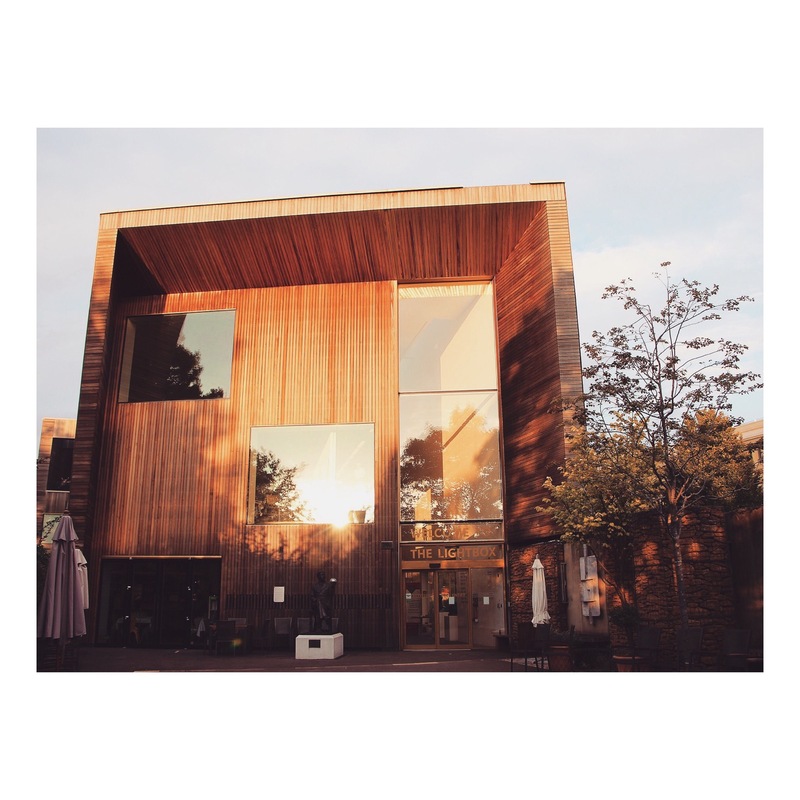 Go and ponder the day away in their store in Hampstead Garden Suburb and then head over for a walk in Hampstead heath for a wholesome day out in London. 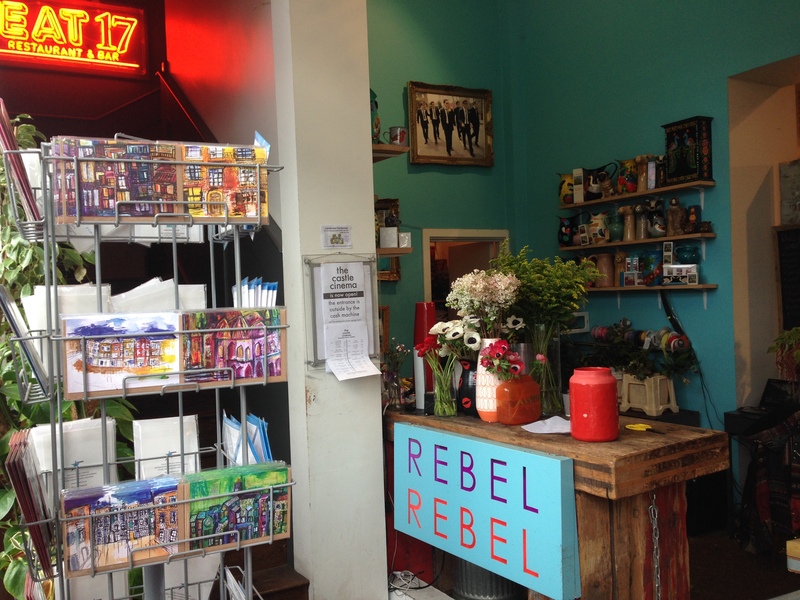 Rebel Rebel in Hackney, East London is another floral gem which we are thrilled to have as our stockist! The independent and experimental florist is a feast for the eyes with their beautiful display which features a floral arch. Located on Brooksby’s Walk, drop in, pick up some beautiful flowers and enjoy a great day out at Chatsworth Road market! As our local deli, Palm 2/Organic and Natural is close to our hearts – they source the best fair trade and organic products. Situated in Clapton Pond it’s the perfect place to stop by and grab delicious fresh produce made daily by chefs. You can sit in or take a yummy box of goodness away to eat al fresco while enjoying the sunshine in Hackney Downs. 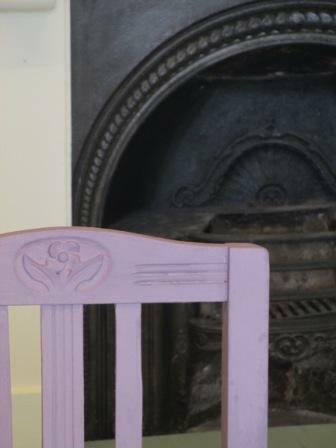 If you’re feeling creative then why not head to Kent and visit Smoke on the Water in Deal where you can partake in a workshop and learn how to transform old furniture using chalk paints – for a shabby chic new look. 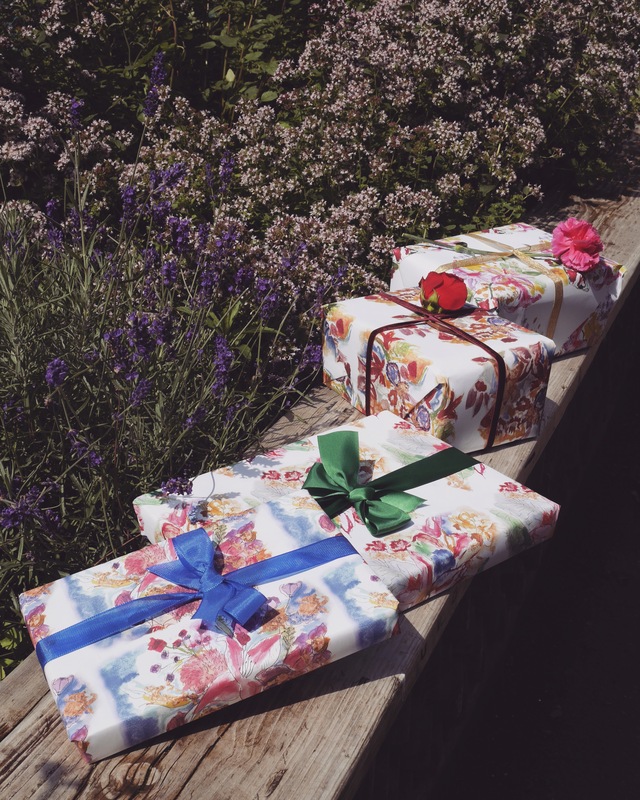 They also supply French-inspired hand painted vintage furniture and a unique range of decorative items household accessories, soft furnishings, gifts and greeting cards. Violet Hill Studios is very close to our hearts. 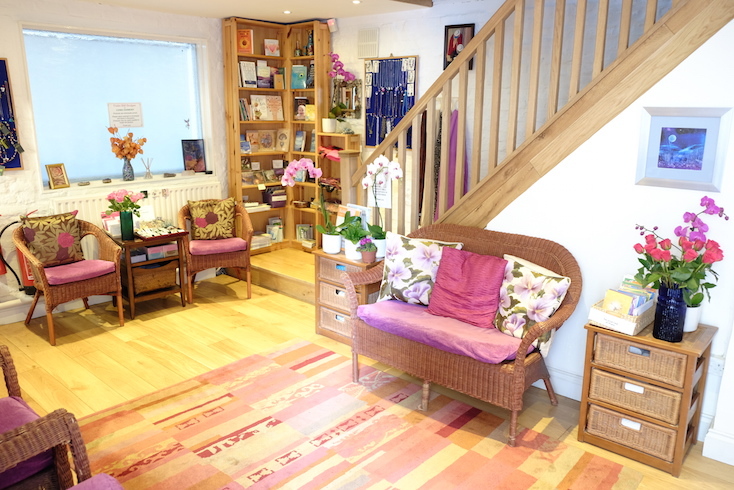 This beautiful centre for natural healing is a little piece of joy in the heart of London. With an extensive selection of natural healing disciplines, ranging from yoga to family consultations, you can also find a selection of Natasha Jade cards. 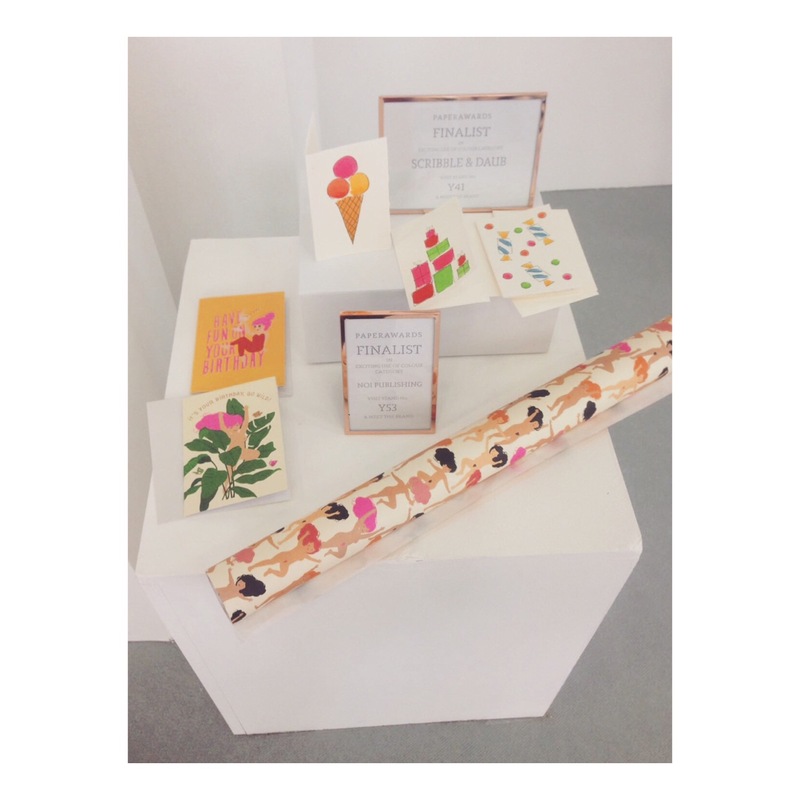 Natasha has a special personal connection to the beautiful studio so it’s with great pleasure that our cards are now stocked there. 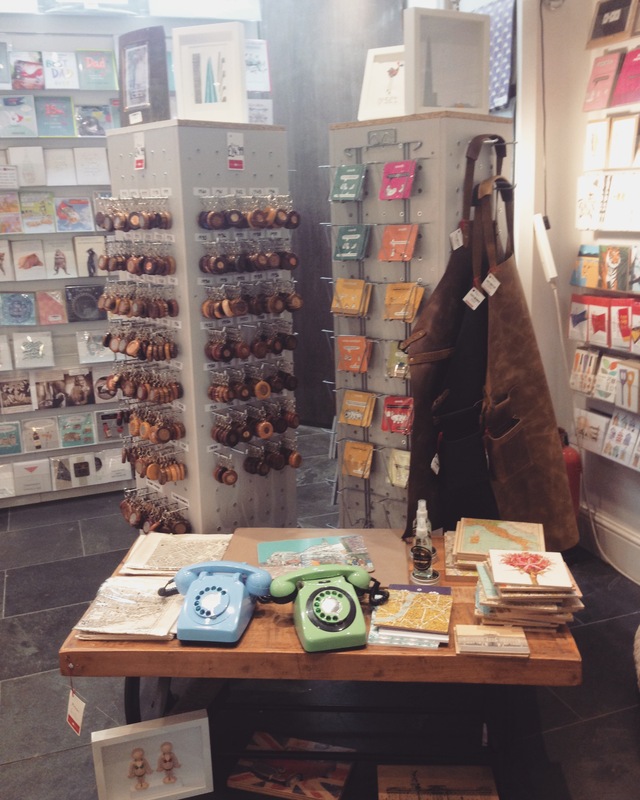 We hope you enjoyed reading about our fabulous new stockists! To find your nearest Natasha Jade stockist, visit our stockists page.